Here is what I 'm sharing today. Now let's see your Halloween Creations.. This is so cute! Love all the embossing and glossy accent! I'll be entering this challenge! LOL....UNBELIEVABLE!!!OMG! !A Fabulous Job on the Embossing!A very Creative idea on using Glossy Accent on the Dots!WOW!!!STUNNING! !Love it!Awesome Challenge! 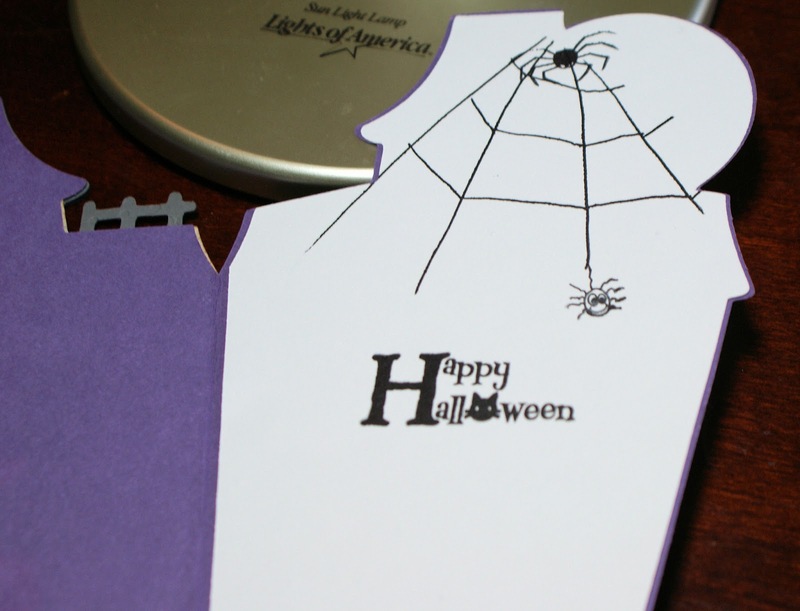 The inside of the Card is Super Cute and Spooky! Oh Nana, this is gonna be a fun one! Love this spooky house. Wow, this is so awesome! I love the embossing and the shape is so fun. Great Halloween card:) I hope to get back to join in the challenge! Super fun and spooky! Great embossing! What a great Halloween card. Love your haunted manor! Thanks so much for participating in the Crafty Friends challenge. Cute haunted house. Love the glossy accents on the fence and the inside stamp. How super fun is this?!!! Love all those googly eyes and adore the embossing. Congrats on Challenge #1. I will share this in the Crafting Blog Events group so your challenges will be put on the master list at My Cricut Craft Room, too. Will you be hosting them every month? Absolutely amazing! You really did an awesome job on this, all the detail and embossing, love it!! Thanks for playing at My Craft spot. this is super I love it. so spooky cute. That is such a amazing project, just adorable! 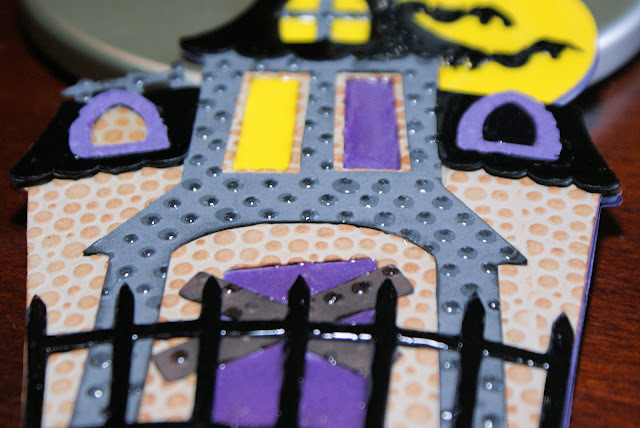 I just love your spooky boo-licious project! How fun is this! I just made my very first banner and entered your challenge. I called my friend, Janis Lewis, and she walked me through adding your Blinkie to my blog! You can check it out at my blog. What an awesome haunted house card! I love all of the fun details you added!!! Wonderful job, Nana! So spooky!! Good luck with the challenges. love you card will have to get that file! I'm looking forward to joining this party real soon. love the card.cool goosebumps on paper. LOVE your card!! 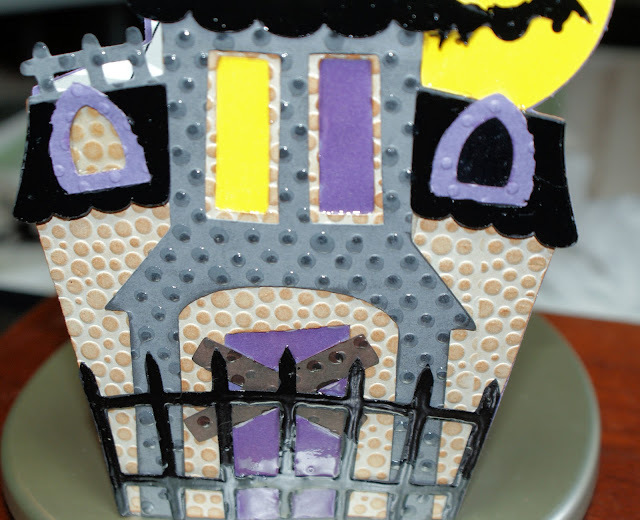 What a great Halloween shaped project!! Lots of awesome entries for this fun challenge already!! Thank you Nana for your very kind words!! I just linked my Candy Corn Witch!! Just thinking....................how lucky am I to have met such a wonderful, caring, giving girl like YOU!!! Thanks for all the wonderful fun and I just love your new blog page withe the animation. grabbed your blinkie too! And subscribed! How adorable is your Haunted Manor! LOVE it! oh this is a gorgeous haunted house, love all the wonderful details Nana!!! I have a bunch of upcoming halloween projects...I'll be posting them all this weekend! Thanks for the reminder to link up, Nana! Done and done :) I love Halloween. Love the challenge! You have made a great card! New follower! Wow! 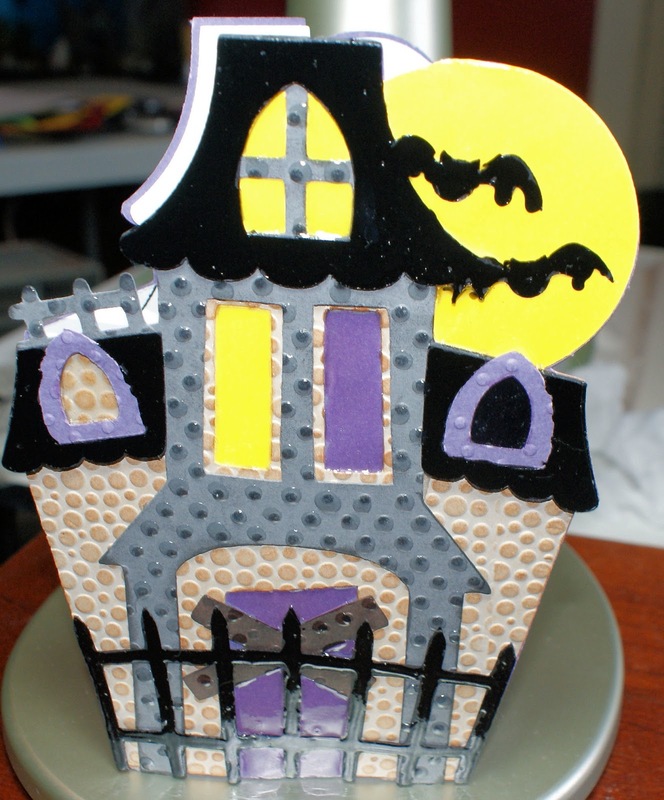 Is this haunted house card ever "bootiful"! All the entries so far are terrific! Okay Nana, you convinced me. I entered your challenge. Although, I only have one image of the card posted above. Would it be okay if I linked the other 2 photos? I posted about the challenge on my blog with a link back to your post as instructed. I always keep your blog button on my sidebar since I discovered your great blog. Hope to see many more entries. I hate spiders!!!!EEK!!!! So, why did I create this one? It's because YOU have such a fun, inspiring Halloween challenge...that's why!!! Your haunted house looks so awesome and the entries so far are GREAT!! thanks for hosting this challenge...I already know you are the BEST! Congrats on your first challenge!! I just linked my project into your fun challenge. Your card is so awesome, Nana!! I love the haunted house!! And what a fun challenge!! I'll definitely be linking up soon!! Thank you so much for inviting me to play along in your challenge Nana! I didn't even know it was going on! LOL! BTW, Your card is ADORABLE! I love the haunted house and spider web! What an amazing colorful haunted house Nana!!! IT'S SPECTACULAR!!!! So in love with it... I am hoping to participate if I have time!!!! I just linked up my Halloween bag and will be back later to link up more projects!! Congrats on your first challenge and thanks for letting me know about it! Just linked up and added your cute button to the sidebar of my blog! What a fabulous card!!! I am wondering if I can enter your challenge even if I don't have a blog? I have a Flickr account. Thanks! Fabulous card, simply love the embossing!! Wow... your card is awesome!! Love all the embossing! :) I am super excited about the challenges you will be doing. WOW! Your card is gorgeous! That cut is fabulous! The inspiration is fantastic - WOW the entries are amazing! Just added my Halloween Treat Bag! Awesome job on the HH. Thanks for the invite. Thanks for a fun challenge. So many great entries. Thanks for a chance on this fun challenge! Woo hoo!! I just linked another project. Great Challenge. So happy to participate. Lots of great ideas on here.